Organic chicken breast brined, cooked, and roasted. This delicious, succulent roast chicken has been produced using organic chicken reared in and around the Pembrokeshire Coast National Park. Our chickens are fed on a cereal based diet free from GM ingredients and have been grown to strict Organic Farmers & Growers standards. Why not try a New York style chicken sandwich? 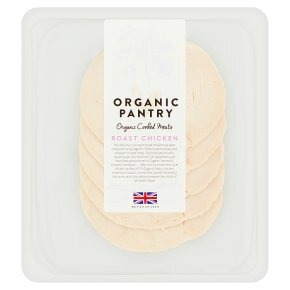 Fill Organic Pantry organic chicken, American mustard, cornichons, sliced Emmenthal, red onion and crisp lettuce between two slices of rye bread. Enjoy! Prepared with 110g of chicken per 100g of product. Moisture is lost during cooking and roasting.